Shopventory services merchants all over the world, so we've made it easy to do business in your local currency. 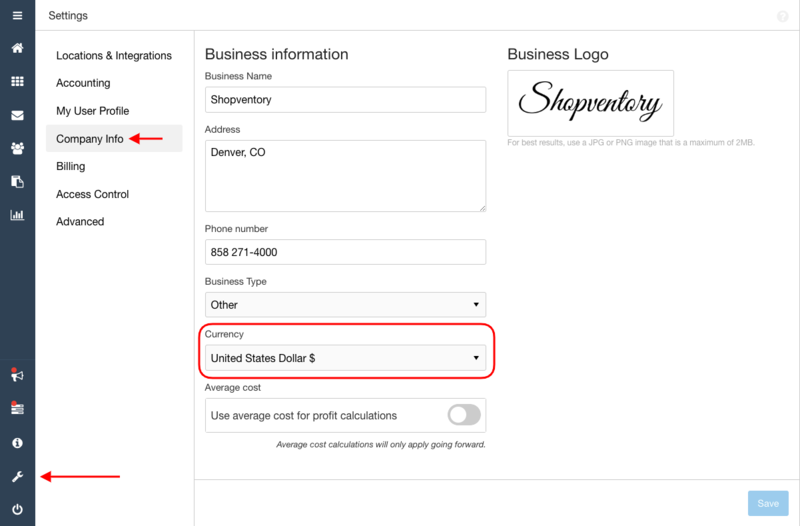 Simply navigate to the Company Info tab in the Settings section of Shopventory. There you will see the option to set your currency. Shopventory does not do any sort of currency conversion. The symbol is the only thing that changes. This will update the symbols across all reports. Only one currency can be active for one Shopventory account at a time. The selected currency will apply to all locations. All you have to do is ask! Simply contact us and let us know which currency you'd like us to add next! Be sure to let your friends know. The more requests we have for a currency, the sooner it will be added. For users of currencies that don't use decimals (e.g. Vietnamese Dong, Zimbabwe Dollar, etc. ), Shopventory will still add a decimal point before the last 2 digits. You can simply disregard the decimal point in Shopventory. Currencies with Arabic characters like the Omani Rial, Jordanian Dinar, etc. will cause exports to be formatted right-to-left vs the Western standard of left-to-right.